Save up to 80% on new Week Long Deals on Steam, available now until September 23rd at 10AM Pacific time! -Enabled binding more mouse buttons in controls, up to the 10th button from previous 3. -Updated code and libraries relating to Steam, hopefully fixing graphical issues for Linux and Mac related to Steam overlay. Save up to 75% on new Week Long Deals on Steam, available now until May 27th at 10AM Pacific time! -(Engine) Fix window resolution not correctly restoring after going in and out of full screen mode. -Added a 'hidden' save data import/export feature. Check the readme for details. 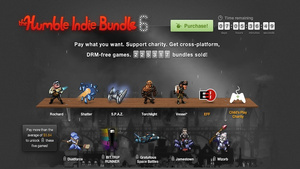 Just because there've been a lot of humble indie bundles over the last few years doesn't mean they're any less of a good deal. 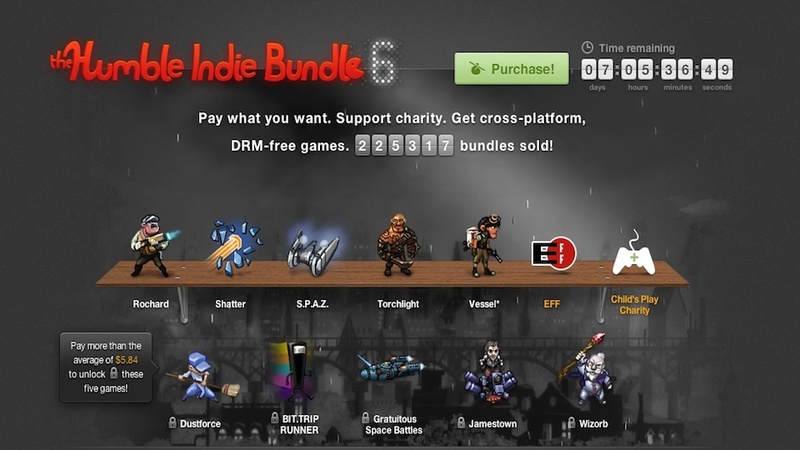 The latest humble bundle offers a crapload of good games, all for whatever price you want to pay. For as little as you want, you'll get EFF, (Wait, that's not a game! That's the very cool Electronic Frontier Foundation), Vessel, the first Torchlight (hard to play that now that the sequel's out, but hey, it's cheap), S.P.A.Z., Shatter and Rochard, a game I've always wanted to play but never had a chance. Throw down anything above the average price (currently $5.84) and you'll also get Dustforce, Bit.Trip Runner, Gratuitous Space Battles, Jamestown and Wizorb. That sure is a lot of video game for six bucks. An update to Rochard has been released (1.23). o	New localization languages added: Russian, Polish, Czech, Portuguese, Brazilian Portuguese and Turkish. An update to Rochard has been released (1.2). • Hot-plugging gamepad now works. • Steam3 (SteamPipe) content system enabled. This requires a full content download, but future updates will be much smaller. • Heavily compressed content with caching is not used anymore, slightly improving load times. • Steam-related errors which prevent playing the game are now properly shown at game startup. • Fixes to some localized texts to make them fit the screen area on low resolutions. • Minor fixes to level content.